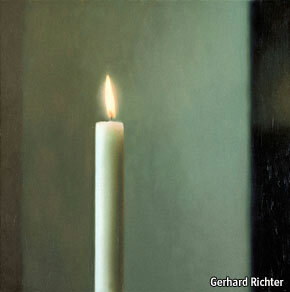 GERHARD RICHTER is the world’s foremost living painter. The German artist, who turns 80 in February, is represented in the collections of the most distinguished modern-art museums and has had a large number of solo retrospectives. The latest, “Panorama”, has just opened at Tate Modern in London and will travel to Berlin and Paris. In the 1950s Mr Richter studied mural painting at the Dresden Art Academy where communist realism was the only style allowed. Inspired by the freedom of abstract painters like Jackson Pollock and Lucio Fontana, he defected to the West in 1961. Many influential art historians now say Mr Richter is as important as these post-war masters. However, he doesn’t revel just in critical acclaim. Mr Richter enjoys unrivalled commercial success too. According to artnet, an online firm that tracks the art market, $76.9m worth of Mr Richter’s work was sold at auction in 2010. This was substantially more than any other living artist, including Jeff Koons, Damien Hirst or the Chinese favourite, Zeng Fanzhi. The market for Richter paintings is deep and widespread. Jasper Johns sells chiefly to ageing Americans and only his early works fetch exorbitant prices. By contrast, many periods of Mr Richter’s painting enjoy strong global demand. Demand for Mr Richter’s painting is similar to that for Andy Warhol. But the market is more transparent. It is driven by collectors rather than dealers, who stockpile or underbid simply to push up prices. Mr Richter’s complex body of work also has a “learning curve”, that has kept out speculators looking for more blatantly commercial painting. Marian Goodman, Mr Richter’s primary dealer since 1985, plays a role in seeing that the Richter market is what she calls “an honest game”. Ms Goodman regards auctions as a “necessary evil” and does her utmost to ensure that the works that she sells do not appear there. She tends to price the paintings coming out of the studio at well below the values achieved at auction. She also selects buyers carefully, preferring a patron who is willing to donate works to a museum. It can take years of lobbying for a collector to get in her good graces. A good museum retrospective invariably casts fresh light on an artist’s work. The new Tate Modern show looks evenly at all aspects of Mr Richter’s painting, and not just the genres preferred by today’s market. Indeed, if his collectors contemplate the Tate show carefully, they may crave a whole different set of Richters.